1. Darphin Intral Cleansing Milk - I love a good oil or balm cleanser to remove my makeup, but for a second cleanse I often reach for a cleansing milk as a great way to nourish the skin and ensure the cleansing process isn't stripping the skin. This Darphin cleanser is incredibly creamy yet gentle and leaves my skin feeling calm and soothed. In addition to using it as a traditional cleanser, I like to apply it generously and leave it on for a few minutes as a hydrating treatment. 2. 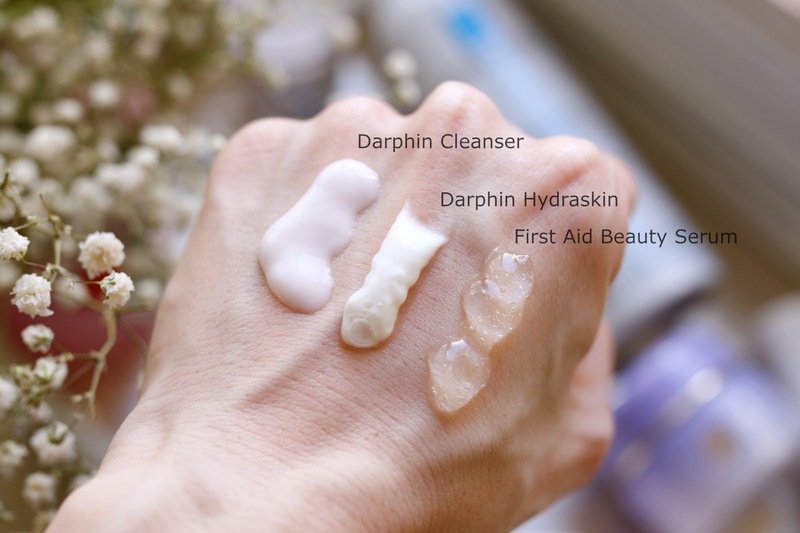 Darphin Hydraskin Essential Emulsion - Typically hydrating or moisturizing products are seen as heavy or rich in texture, but I find that some of the most lightweight creams can enrich my skin the most. This Darphin moisturizer has a texture that combines both a cream and a gel and would be great for either winter or summer. It has the richness needed to nourish the skin in the winter, yet is still light enough to feel comfortable on the skin during the warmer months. I love this as a daytime moisturizer and find that it wears beautifully under makeup because it keeps my skin hydrated without increasing shine throughout the day. 3. 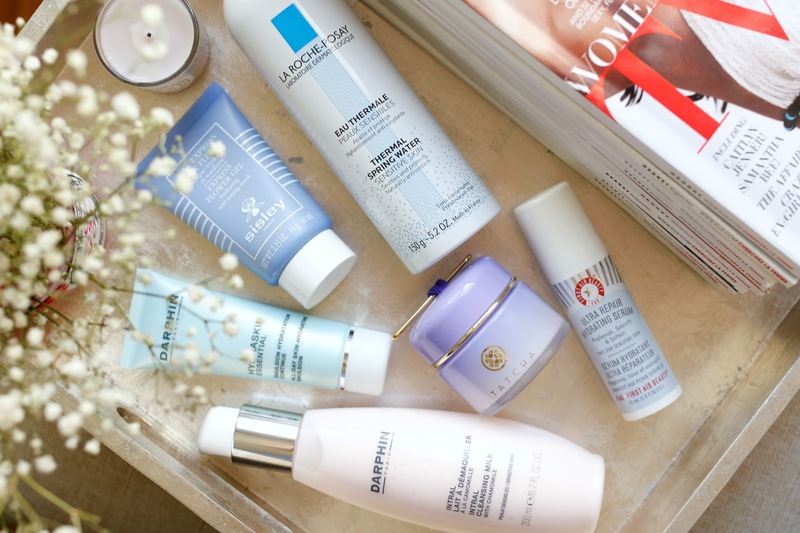 First Aid Beauty Hydrating Serum - This. Serum. From just the look of it, you can already guess that it is like a shot of water for the skin. It's deceptively thicker than it looks on camera and only one small pump is good to cover the entire face. I find that if I use too much, it can feel too heavy or tacky on the skin. That being said, my skin has been loving this serum since the first day I used it. My skin feels better (less tight, soothed) and looks better (more balanced) while using. Because of it's tendency to be a bit tacky, I prefer to use this at night or on the weekends if I am not wearing makeup. However, the results of this serum far outweigh any texture issues - I would recommend this for anyone looking to add in a moisturizing serum to their routine. 4. Tatcha Overnight Memory Serum Concentrate - Sadly the picture above does not do this texture justice. I posted a video to my Instagram showing how unique it is - watch that here. See? It's hard to look away from, isn't it? LOL. Many people asked me if it was similar to The Body Shop Bouncy Sleeping Mask and in theory it is, but I found this concentrate to be much thinner in texture with a more gel-like consistency when you break it up on the skin. Additionally I felt that the Tatcha concentrate gave me a stronger boost of hydration, whereas The Body Shop mask delivered more on firmness. I have enjoyed using this alone after I have cleansed and toned. If I wanted to address any other concerns, I could layer a serum under this but this concentrate did a fantastic job of acting as both a serum and moisturizer. 5. Sisley Express Flower Gel Mask - It's no wonder Sisley is known worldwide for their masks - they are truly some of the best around. I have been using this one for the past few years and it's one of my favorite masks to help nourish and calm my skin. It's decadence in a tube. And this one is just as luxurious. There are very few products that can hydrate my skin to a visible difference nearly instantaneously (this sheet mask is another one of those instant miracle products), but this mask manages to do the impossible. I think they should rename this Sisley Express Flower Gel Infusion rather than mask because that's exactly what it feels like it's doing - infusing my skin with moisture. Truly splurge-worthy. 6. La Roche-Posay Thermal Spring Water Mist - I'm a total mist gal. I love using them in my skincare routine, I love using them throughout the day - I exercise my right to mist anywhere and everywhere. This Thermal Spring Water mist is delicate in application (no sudden heavy bursts of water from the nozzle #rude) and delicate in feel. I particularly like using this if my skin is feeling irritated or sensitive as it is calming to the skin. This may sound a bit silly but I find it to be calming to my energy as well when I spray myself with it. I close my eyes and mist away giving myself a mini 5 second break from the day. Cupcakes can also do that but there is less guilt afterwards with a mist. I really want to try more Darphin products. I got a facial with them here in LA, and the products were my favorite part (the lady was a little rough, and rush, such a bummer for a facial). I really want the chamomile oil and this cleansing milk seems great. Haven't come across Sisley product yet but that mask sounds great!